There's nothing new about a dangerous suspect dying at the hands of police. But Thursday night in Dallas, the situation played out with a twist. Micah Johnson, believed to have fatally shot five police officers, was killed by an explosive device that a robot delivered. Two executives at robotic companies told CNN this is the first time a police robot has been involved in a civilian's death. "We saw no other option but to use our bomb robot and place a device on its extension for it to detonate where the suspect was," Dallas police chief David Brown said at a news conference Friday morning. "Other options would have exposed our officers to grave danger." It's unclear exactly what type of robot was used in the suspect's death. Robots are common inside police departments, and generally used to disable explosive devices or disorient and incapacitate suspects that are barricaded. To do this, the robot generally carries a flashbang, a device that emits a bright light and loud sound. 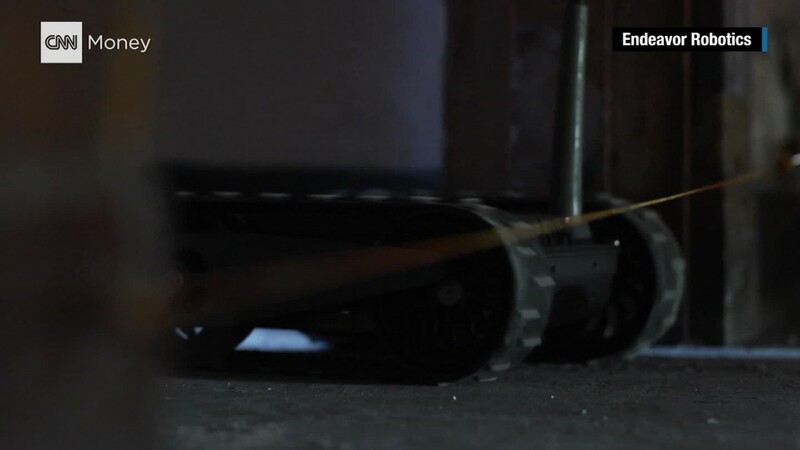 Sometimes these robots are used to place an explosive near a bomb in order to disarm it via explosion. Northrop Grumman Remotec, which calls itself the largest providers of robots to first responders, declined to comment and referred all questions to the Dallas police department. The robot was likely expensive, with a price tag of around $100,000, according to Endeavor Robotics chief executive Sean Bielat. Endeavor Robotics sells its robots to agencies in the greater Dallas area, but wasn't sure if its robot was used in Thursday's incident. These types of ground robots do not operate autonomously, but are under the control of a human operator. Similar models are used overseas to disable explosive devices in places such as Iraq. Using one to kill a suspect in the U.S. is unheard of. "I think this is an anomaly," said Brian Hart, the president of Black-I Robotics, which makes ground robots for the government. He doesn't foresee a new trend of police using robots to kill suspects. It's unclear if the Dallas robot was present at the time of the explosion, or left the explosive device and retreated to safety so it wouldn't be harmed as well. Bielat's ground robots, which are designed for law enforcement, aren't designed to be used for lethal purposes. But that doesn't stop them from being used that way. "If the first responders who were there thought this was the most appropriate way to use it, it must have been the most extreme situation," Bielat said. "It's tragic that this situation ended this way, but it was in respond to an even greater tragedy." Bielat said using robots in police encounters can actually improve safety and reduce deaths. "You can't shoot second if you're a person and you're dealing with somebody's who is armed," Bielat said. "But if you're a robot you absolutely can."